Bristol Festival of Puppetry is the only English Festival to celebrate the art form of puppetry on stage and film, attracting audiences from far and wide to the city. For the first time in 2015 they are spreading their wings across the city to present puppetry on land and water. The adventure continues as the festival goes multi-venue for the first time. On the first weekend, the expanded film programme takes over the Watershed, featuring legends of the animation world: The Quay Brothers, Barry Purves and Ivor Wood. The Tobacco Factory Theatre is also involved with some of the most astonishing performances, including premieres from Bristol companies Pickled Image and Wattle & Daub Figure Theatre. The organisers are also working with the Arnolfini to present the UK premiere of Ramkoers, a unique and visceral music/object theatre performance from Dutch outfit BOT. The programme of outside work includes an installation from The Quay Brothers at the Redcliffe Bascule Bridge, Babok will be opening up Asiel – a shelter for unwanted domestic appliances – to visitors at M Shed and outside Arnolfini and MUFTI would like to invite you to join a game of MASSIVE Battleships at Brunel’s ss Great Britain. Experience George Romero’s classic horror film on the big screen at the stunning location of Kingsweston House. Entry from 19.30 – film to start after 20.30. Organisers advise to bring your own blanket or chair & that food and drinks are available. Get your wellies on! Rain or shine, this is one festival where you’ll actually need them…. Valley Fest is all about the family, all about fun and all about the land. For three days in August (28-30), an organic farm in the heart of the Chew Valley, Somerset, will be transformed into a festival that celebrates all things good. 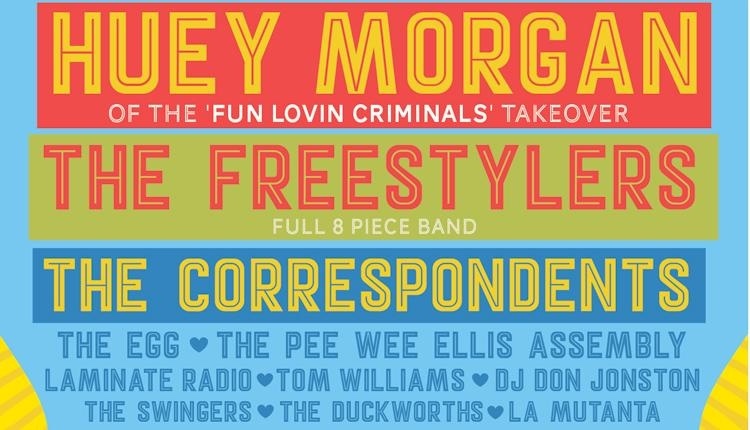 Huey Morgan (the Fun Lovin’ Criminal) with his first ever festival DJ takeover | The Correspondents | The Freestylers | The Pee Wee Ellis Funk Assembly | The EGG | Gypsies of Bohemia | DJ Chris Tofu | The Rythmites | Dj Don Jonston | The Swingers | The Duckworths | La Mutanta | Dele Sosimi | No Go Stop | Tezeta. New for 2015, Valley fest will host 7 themed venues – known as the Tipi Valley, the Green Valley, The Tutti Frutti Valley, the Open Mic Valley, the Kids Valley, the Circus Valley, and the Craft and Healing Valley. Fancy dress theme: THE WILD WEST! Tagged 2015, bristol, Bristol Festival of Puppetry 2015, bristol music, chew valley, Festival, film, glastonbury, Kevin Mcgough, Kingweston House, Must see Monday, Night of the Living Dead Outdoor Cinema, Somerset, the fix, the fix magazine, tobacco factory, valley fest, whats on. Bookmark the permalink.